A government spokesman has threatened a purge at the Treasury unless it finds the cash to pay for costly welfare handouts. Blaming the deep state won’t help. Global investors will stomach a bigger deficit only if Italy’s debt remains stable. Voters are in for a disappointment. 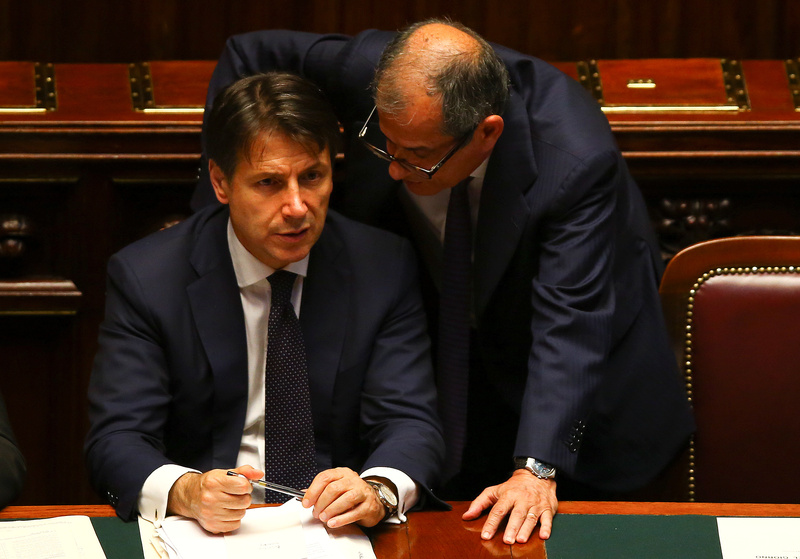 Italian Prime Minister Giuseppe Conte talks with Economy Minister Giovanni Tria during his first session at the Lower House of the Parliament in Rome, Italy, June 6, 2018. Rocco Casalino, a spokesman for Italian Prime Minister Giuseppe Conte, threatened in an audio clip published by La Repubblica on Sept. 22 to sack Treasury officials in a "mega-vendetta" if they fail to find the resources needed to finance flagship welfare handouts proposed by the anti-establishment 5-Star Movement. Italy’s two governing parties, 5-Star and the right-wing League, have been pressuring Economy Minister Giovanni Tria to propose a budget law that can deliver on electoral promises that include lower taxes, a reform of the pension law and a so-called citizens' income. The government must set growth, deficit and debt targets for next year by Sept. 27. Statistics agency Istat said on Sept. 27 Italy’s debt-to-GDP ratio stood at 131.2 percent at the end of 2017, down from an initial estimate of 131.8. Rating agency Moody's will decide by the end of October whether to downgrade the credit worthiness of Italy's sovereign debt, which it currently rates Baa2 or two notches above “junk” level.